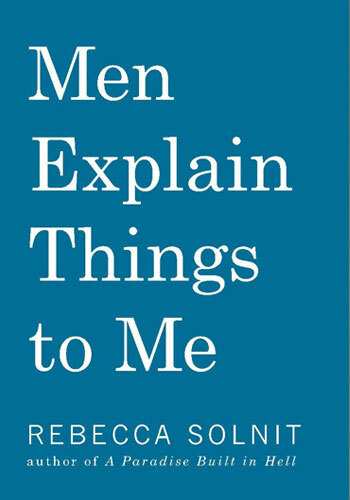 If you want men to leave you the hell alone in public, read this book. The title not only indicates you will not be afraid to yell at them if they harass you, but reading it also gives you the inner strength of 2.5 Gloria Steinems, which means you will yell at them if they harass you. Most women fight wars on two fronts, one for whatever the putative topic is and one simply for the right to speak, to have ideas, to be acknowledged to be in possession of facts and truths, to have value, to be a human being. Yeeeeees, Rebecca Solnit, speak to usss. This book is my jam, and it makes me want to read all of her stuff, because this one is hella short and only gives you a glimpse of her thoughts, fantastic as they are. People kept asking me if it's funny, and no it is not -- HOWEVER. 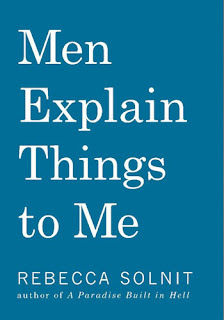 I brought it on my church's women's retreat, and right before a session began, I told the woman sitting behind me the story behind the title, which meant our speaker tried to begin, but was interrupted by whoops of laughter for approximately 30 seconds from my section. The book is composed of mini essays, each speaking to a different area of feminism. They are all excellent. By marriage, the husband and wife are one person in law: that is, the very being or legal existence of the woman is suspended during the marriage, or at least is incorporated and consolidated into that of her husband; under whose wing, protection, and cover, she performs every thing; and is therefore called in our law-French a femme-covert...or under the protection and influence of her husband, her baron, or lord; and her condition during her marriage is called her coverture. For this reason, a man cannot grant anything to his wife, or enter into covenant with her: for the grant would be to suppose her separate existence. Solnit makes you start to rethink the everyday, which is what the most valuable writing does. We should have a national discussion about this book.